I recently bought Happily Unmarried Face Wash and after using it for over two weeks, I am very happy with the results. Here is my review of Happily Unmarried Face Wash Dry to Normal Skin. 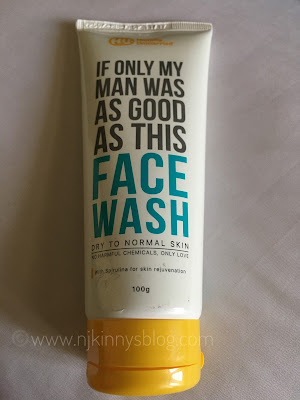 1) I loved the quirky quote on the face wash tube that says "If Only My Man Was As Good As This Face Wash." Typical Happily Unmarried, the packing is unique and makes this face wash a great gifting option. 2) Happily Unmarried is a trusted brand and again my initial decision to buy this product was based on this being a branded product. 3) This face wash is harmful chemical free. It contains no Parabens and SLS that are harmful for the skin. 4) Happily Unmarried Face Wash contains skin friendly natural ingredients like Spirulina extract that is helpful in skin rejuvenation and maintaining a healthy skin tone. 5) I loved the citrusy fragrance of this face wash which is neither too subtle nor too intense. It is just right and soothes the senses. A transparent face wash, I love its citrusy fragrance. 6) The face wash easily lathers and only a small quantity is required to clean the face. 7) The dirt and dead skin is easily removed. The face feels clean and fresh after each wash.
8) The skin feels soft, supple and even toned. I have seen an improvement in the clarity, vibrancy and tone of my skin ever since I have started using this face wash.
9) The face wash comes in a travel friendly tube which is leak proof and can be easily carried around. 1) This face wash is priced slightly on the higher side but since only a very small quantity of face wash is required, the tube lasts long which makes the price okay. 2) The moisturising aspect of this face wash needs improvement. I felt my skin dry a bit at places and I have normal skin. 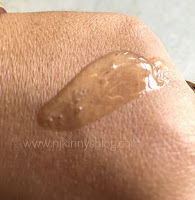 All in all, I am very happy with Happily Unmarried Face Wash Dry to Normal Skin and Njkinny recommends it to people looking for an effective and great smelling, chemical free, natural face wash. I only have complain with the moisturising part but otherwise this is a great product and a great gifting option.